Is there ever a wrong time to eat avocado toast? The answer: absolutely not. We love the crunchiness from the toast and the creaminess of the avocado, plus the salty sprinkle on top. It’s so good! The only thing keeping us from eating avocado toast every day of the week isn’t that we don’t have a perfectly ripe avocado to smash on our toast; we have this hack to have a ripe avocado at all times, after all. 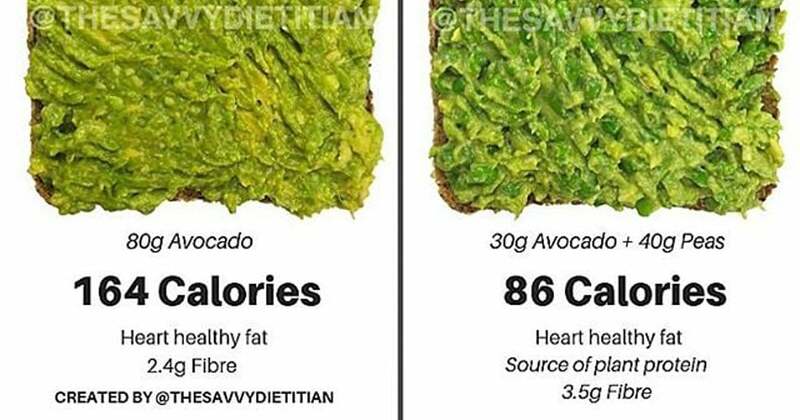 The issue is that avocado toast isn’t exactly low in calories. Avocados are filled with healthy fats, but they’re still calorie-dense — and it’s easy to go overboard because avo toast is so damn tasty. But this avocado toast hack is about to blow your mind. Registered dietitian Savina Rego, RD (@thesavvydietitian on Instagram) posted this “volume eating hack” to upgrade your avocado toast experience and help you lose weight. She said that even though avocados are loaded with healthy fats, fiber, vitamin C, and folate, a serving size is still only about 30 to 50 grams. “My trick is to mix avocado with either green peas, edamame or ricotta/cottage cheese (regular or reduced-fat), it helps reduce the calorie load without reducing the volume!” Savina said in her Instagram post. Brilliant, right? Note that the stats above are for the toppings only and don’t include the bread. This trick helps make this deliciousness a little more balanced. You’ve got carbs from the toast, healthy fats from the avocado, and protein from the peas or cottage cheese. This trifecta is not only lower in calories and higher in fiber, but it’ll also keep you feeling full and satisfied, which will prevent you from reaching for more food and help you lose weight.